I have been seeing some terrible movies lately, but March brings the European Union Film Festival to the Gene Siskel Center in Chicago. I’m now halfway through my program of six films at EUFF (I started with Sweden’s Behind Blue Skies). This is my first time dealing with this festival and while I really like the slate of films (there are sixty-four so tons of options) and that the fest is spread out throughout the month, I would definitely recommend buying all your tickets in advance if you ever feel like hitting up the EUFF. I got mine all at once and have avoided standing in the ludicrous box office lines. The Siskel Center is a bit cramped on lobby space so it can get kind of uncomfortable when the box office line is long and people are waiting to get into a screening, too. Tickets in advance, that’s the key. More dual reviews! Written and directed by Renos Haralambidis, who, from what I can gather, is one of the bright lights of Greek filmmaking, 4 Black Suits is a road comedy starring morticians. One of my favorite movies is Waking Ned Devine, so the superficial resemblance to that film is what prompted me to buy a ticket for 4 Black Suits. 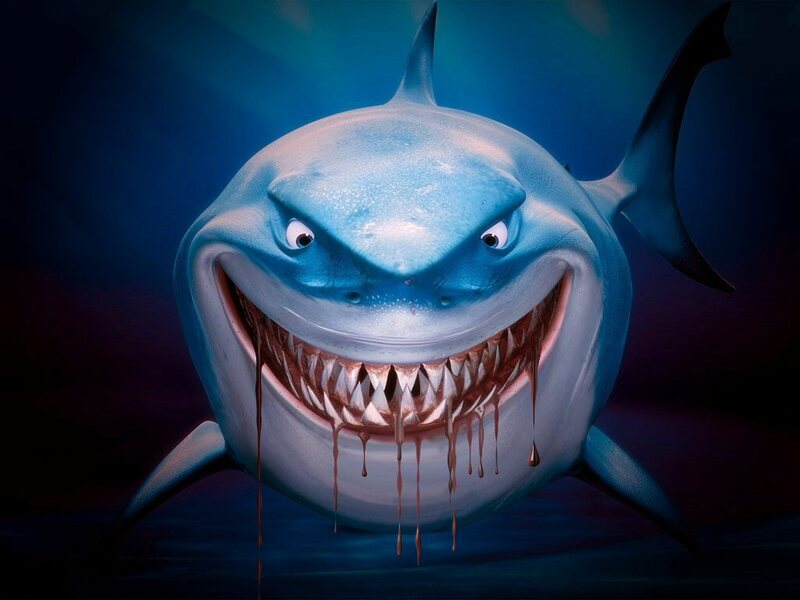 But besides both movies having funereal circumstances, there’s really no relation. 4 Black Suits starts with Mikas Messiah (Haralambidis), a reluctant undertaker who has run his family’s mortuary into the ground with gambling and bad women. Mikas dreams of owning race horses but he’s broke. Then he’s offered a chance to make some fast cash by transporting the body of a deceased Greek ex-pat from Athens to a small village in the Viotia countryside. The deceased, called “Black Haired” for his bad dye job, died in a Costa Rican prison and was a forger who has left some money in limbo that can be claimed once he’s buried. Or so Makis is told—it’s clear from the get Makis, despite his delusions of grandeur, is a patsy and is being suckered. If there is any Costa Rican money, Makis will never see any of it. Still, he believes this is his chance to escape life “under the coffin” and so he puts together a team of pallbearers to transport the body to Viotia. The catch? They have to WALK all the way there. 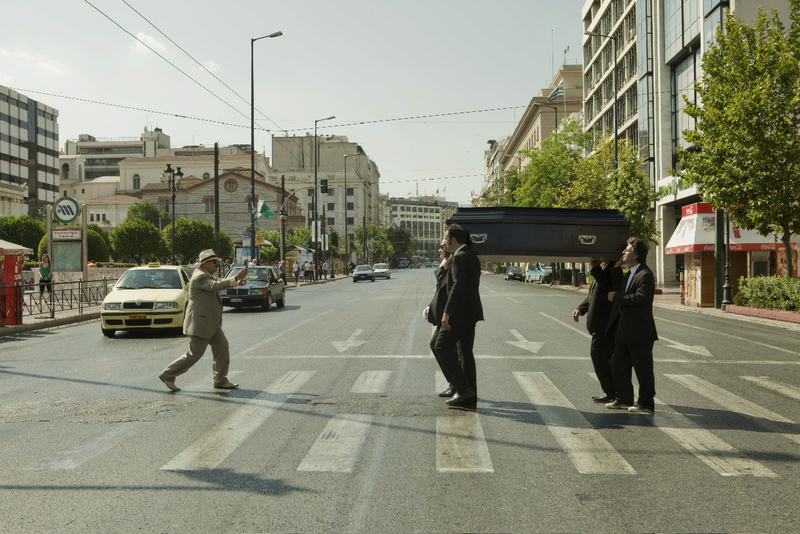 It’s summertime in Greece and their profession dictates they must wear black suits as pallbearers. Makis ends up with a motley crew including unemployed actor Kyriakos (Yannis Zouganelis), alcoholic Babis (Greek rockstar Dimitris Poulikakos), and the recently paroled Kosmas (Takis Spiridakis). 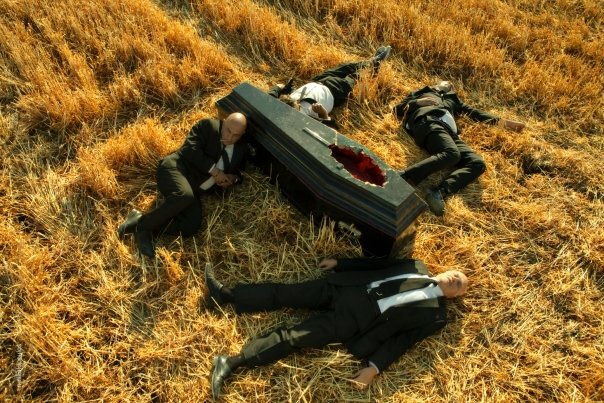 The four men suit up and proceed to shoulder Black Haired’s coffin into the countryside. At its heart 4 Black Suits is about these four hapless boy-men coming to terms with the realities of their existence. But the existential crisis brought on by shouldering a dead man across the countryside is lightened with genuinely funny comedy. The men bicker amongst themselves and in turns have private conversations with Black Haired. Kosmas is confronted by the police officer who killed his accomplice in the armed robbery that landed him jail. It’s a serious side plot but Kosmas’s post-incarceration mantra of “Spaciousness, dude” provides a dose of The Dude-like chill needed to keep things moving along. There’s no great revelation in 4 Black Suits, just four discontented men who find a moment of fulfillment in helping a dead man achieve the long-held promise to return to his lost love, on foot. The film ends with the pallbearers still broke, unpaid and never being paid, filing out of a cemetery. Hope lies in the possibility to have happier lives now that they’ve seen themselves for who they really a re, not who they dream themselves to be. It’s a pretty hefty message for a movie that is really, truly funny. Especially as the pecking order within the pallbearers break down, the laughs come more frequently and get progressively bigger. Moments of despair are broken up by farcical gags and one-liners. I found myself thinking that 4 Black Suits is the road comedy I wanted Due Date to be. Combined with his beautifully composed visuals of Greek urban scenes and countryside, I left the theater wishing that someone would give Haralambidis an English-language project. I’d be interested in seeing if he can deliver such a satisfying comedy in another language, too. 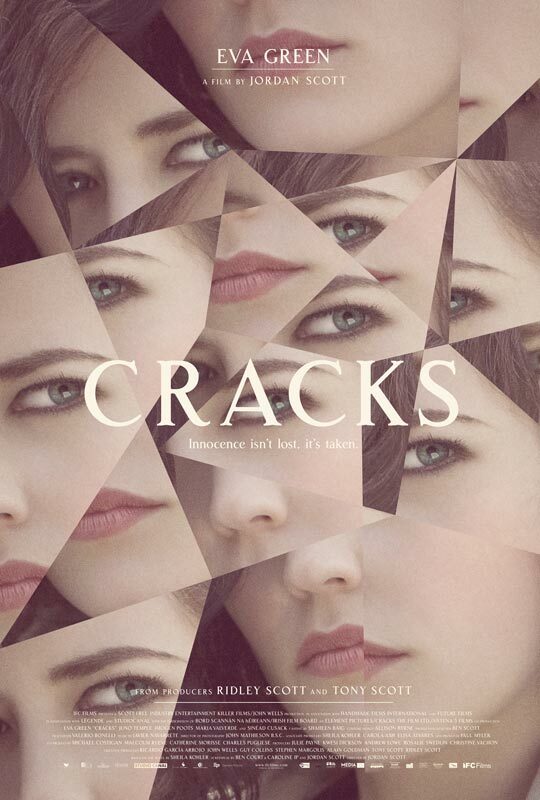 Cracks played in the UK in 2009 and is opening in limited release on 3/18 on this side of the pond. It’s the first feature film from director Jordan Scott (daughter of Ridley, niece of Tony), who also co-wrote the script. 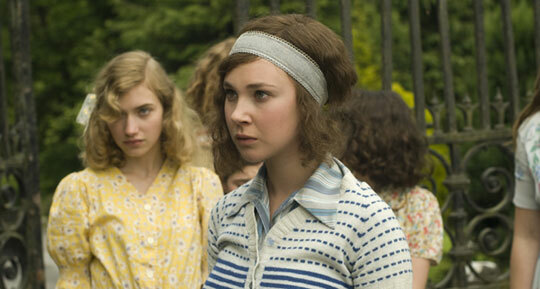 Set in 1934, on rural Stanley Island in England, Cracks follows a group of dorm-mates in a boarding school. Lead by Di Radfield (Juno Temple, Atonement and I swear one of these days this girl is breaking out) who is also captain of their diving team, the girls go through their routine with little to excite them beyond their dashing teacher and dive coach, Miss G (Eva Green, those Narnia movies and Casino Royale). Di is particularly close to Miss G, perhaps her favorite, and she’s That Girl at school, the one who leads through a combination of academics and bullying. 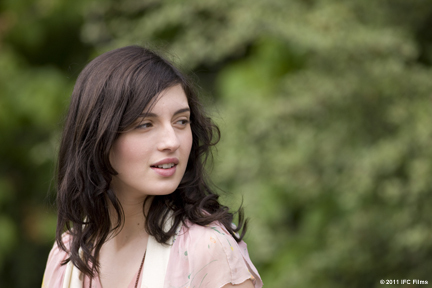 Life at school is disrupted by the arrival of Fiamma (Spanish actress Maria Valverde), a beautiful aristocrat shipped off to England after causing a scandal at home. Fiamma is wealthy, traveled, cultured and the best diver on the team, upsetting Di’s position as “standard setter”. Miss G takes to Fiamma immediately, seeing in her a kindred, worldly spirit, but Fiamma doesn’t take to Miss G. Fiamma doesn’t take to anyone. She never wants to practice with the team—it’s too cold, too hot, she’s just eaten—and she holds herself apart from the games the girls use to pass their idle time. Cracks doesn’t follow the standard storyline, though, and set up Di and Fiamma as rivals for Miss G’s attention—indeed Fiamma wants nothing to do with Miss G. Instead, we see Fiamma struggling to cope with the idea that she really isn’t going home any ti me soon and Di’s desire to make Fiamma fit in so that Miss G will see she’s not so special and they can all go back to how things were. Unfortunately, Fiamma’s presence brings the crazy out of Miss G and despite the girls trying to get along things continue to deteriorate. There is the requisite bullying—Di and her troupe of girls are not saints—but those instances are intercut with scenes of Fiamma acting just as spitefully and then all of them getting along and playing together. That balance served Cracks well. Instead of coming across as some kind of anti-bullying morality tale the movie posits that these are lonely, scared children trying to make a family in a rather hostile environment (in one scene, a teacher instructs the students not to sound “dumpy” in their letters home because their parents don’t want to be burdened with their problems). Perhaps the most elegant aspect of Cracks is the unmasking of Miss G. Without direct confrontation or explicit exposition, we learn that the adventurous heroine she has painted herself to be isn’t really the truth and Green does an excellent job as Miss G’s mental state begins to fray (though she continues to wrestle with her French accent). Temple is as good as you would expect as Di, who holds steadfast for Miss G until the very end, when she begins to see what Fiamma recognized right off the bat. Valverde also shines as Fiamma, swerving between pouty superiority, homesickness, and fear of Miss G. Imogen Poots (Jane Eyre, and possessor of the greatest name ever) also stars as Di’s best friend Lily, and she is so pretty and bright that she commands more attention than her character merits. Can’t wait to get a look at her in Jane Eyre. As for Scott, she shows a surer hand for her first time out than her brother, Jake Scott, did in his sophomore effort, Welcome to the Rileys. Her visuals are gloomy and lush, with lots of rolling green English hills and heathered moors. The contrast between the exterior of the school, a classic English country house (in reality, Ireland’s Headfort School), and it’s plain, almost Spartan interior contrasts again with Fiamma’s posh things. The period is well realized with a tip of the cap to the costuming department. Jordan had a better script to work off of but Cracks feels like a more complete film than Welcome to the Rileys did. Still, Jake and Jordan Scott have now turned in a pair of restrained dramas that show a deftness of touch and sensitivity to character that has eluded their elders completely. And Jordan has her father’s knack for visuals to boot—she’ll be a formidable director one day soon. I only wish we could see movies like the one on this list! Movie ideas based on office supplies. Sounds like a throwback to the Prime of Miss Jean Brodie.